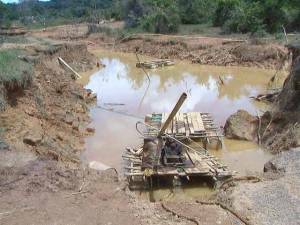 In an earlier post I examined a diagnosis of the environmental and health problems posed by current practice in small- and medium-scale gold mining in Guyana and the recommendations for addressing those problems and improving the policing of mining practices. Guyana’s official news service, GINA, reports that last week Cabinet members ventured out to see if things are really so bad. It is. Just look at these GINA pictures that accompanied the press release on their visit. A few things strike me about the official press release (copied below). First, the claim that the Ministers are being “proactive.” “Proactive” must mean something different in Guyana, because my understanding of the term is to deal with problems well before they become grave. What was reported by Harvard in its analysis, and what we see in these pictures, did not happen overnight. This field trip by the Ministers is reactive, not proactive. Second was the Ministers expressing “shock” at what they saw. Please! Such scenes are probably the worst-kept secret in Guyana. This may be the first time the Ministers saw it in person, but surely they had heard at least rumor of such scenes, and in all likelihood, had viewed pictures. If it really was news to them, what confidence can Guyana’s citizens have in such Ministers? Third, while I know that Guyana only has a handful of mining inspectors, how in the world did three miles of valuable roadway get destroyed, and service of potable water to the locals get so disrupted, without the inspectors having an inkling that such destruction was prospective or in progress? (and if they did know, why didn’t they enforce the law?) It’s one thing when garimpeiros dig up remote sites hidden away in faraway forest preserves, another when it happens openly on a regional road artery. Government’s proactive approach towards challenges faced by citizens, continues as it seeks to propel its developmental thrust. Ministers of Transport and Hydraulics Robeson Benn, Housing and Water Harry Narine Nawbatt and Local Government and Regional Development Kellawan Lall, today visited Region Eight (Potaro/Siparuni) to address several areas of concern. Most notably, has been the destruction of infrastructure by the mining community resulting in the lack of potable water to residents. Minister Benn explained that approximately three miles of the roadway that extends from Mahdia to Salbora were destroyed by mining activity. He stated that he was disappointed and shocked with the condition of the road since this action not only compromises the water distribution network but also economic activities in the area. The Minister said that he and his colleagues who were present on the visit would share perspectives on the issue to find a way out of the present situation. Minister Benn added that any contemplation of repairs to the road will cost Government a considerable amount due to the actions of a few irresponsible operators. He said that in the interim he has informed the Mining Officers and will also advise Prime Minister Samuel Hinds, that no mining should be allowed along the road or its reserves because this act is unlawful and the law will have to be enforced. 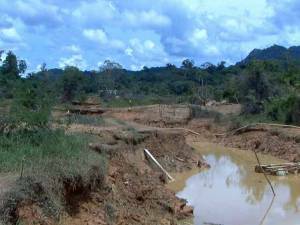 Minister Benn has instructed that mining operations in the area be removed in 48 hours to allow for an assessment to be carried out. Minister Nawbatt and Lall echoed similar concerns on the issues and have indicated that an urgent collective effort by stakeholders is needed to address this situation. The Ministers also interacted with several miners and expressed their dissatisfaction with the emerging events. They were accompanied by officials from the Guyana Geology and Mines Commission, Guyana Water Incorporated and the Regional Democratic Council. A follow-up visit to the area is in train.